With customizable alerts and a library of lullabies, the VM5271 is like a high-tech nanny for your nursery. 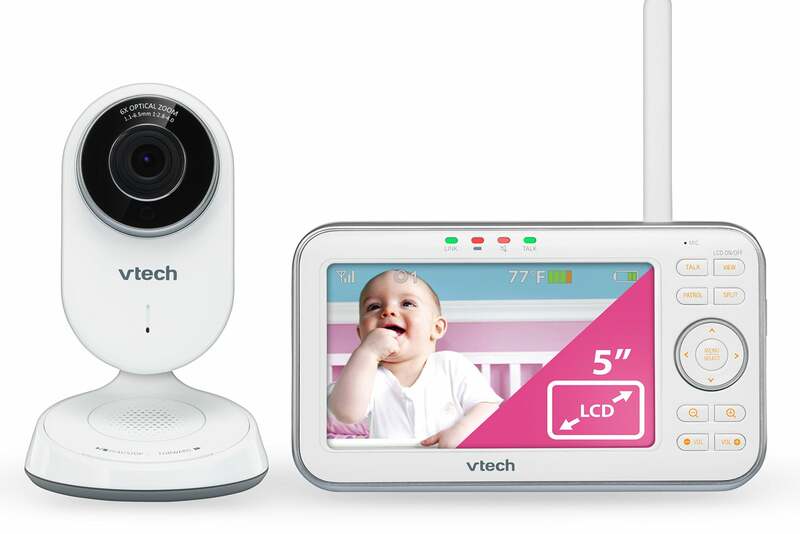 VTech has been busy bringing peace of mind to parents with its expanded line of baby monitors this year. We were lukewarm on the Safe & Sound Expandable HD Video Baby Monitor, a Wi-Fi enabled system that took cues from popular home security cameras, but felt like a work in progress. 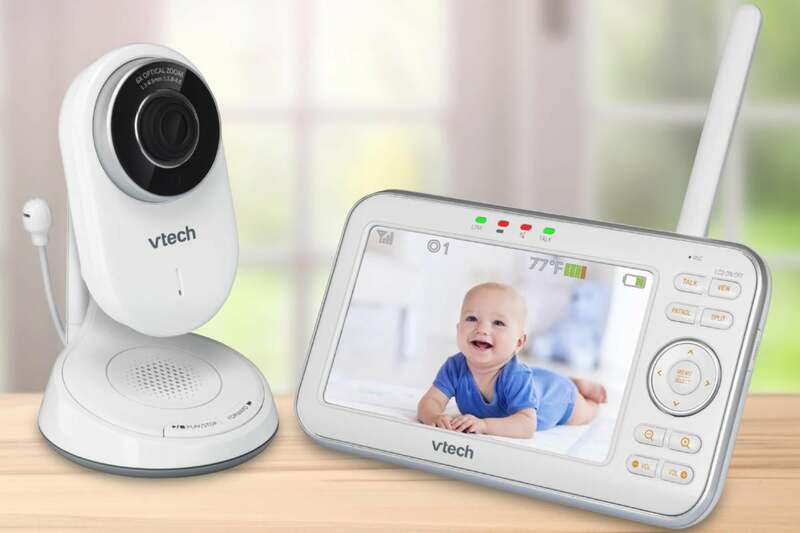 The conventional VTech VM5271 Expandable Digital Video Baby Monitor, however, is more impressive, bringing together some of the best features baby monitors have to offer. The VTech VM5271 comes in two flavors: a single-camera ($159.95) option and a two-camera ($229.95) package. Both include a handheld “parent unit” monitor. You can purchase additional cameras—the monitor supports up to four—for $59.95 each. No matter how many cameras you use, setting them up is a pretty simple affair. First you install the rechargeable battery in a compartment beneath the monitor’s kickstand, then you plug in the monitor’s AC power cord. VTech recommends you use both power sources together for continuous monitoring, and reserve battery power for when you’re moving around the house. You can use up to four cameras with the V5271 monitor. Next you plug in the camera(s). When you power on the parent unit it displays the live video. As the camera will presumably remain fixed on your baby, its articulation is limited to tilting up and down a few inches to get an optimum viewing angle into your child’s bed, whether you set it on a tabletop or mount it with the supplied wall bracket. VTech says the camera has an operating range of about 160 feet indoors, and it had no problem maintaining a connection as I walked with the monitor downstairs and even a short distance outside my house. The camera has a 110-degree wide-angle view, which is plenty to cover an average-size nursery, but video quality isn’t great. Noise was apparent, even when viewing the monitor at a distance, and neutral tones took on a purplish color cast. None of this really detracts from seeing if your baby has rolled onto their stomach or the dog is climbing into the crib, so take it for what it’s worth. Once the camera is set up, you can manage all its features and monitor your baby’s environment from the parent unit. In addition to the camera image, the 5-inch high-resolution LCD displays the temperature and the sound level in the room the camera is monitoring, the latter via a nine-level sound indicator. It will also display various camera modes—split screen, night vision, etc.—as they’re used, as well as the number of active cameras and the monitor’s battery life. The system’s camera has a 110-degree field of view with 6x optical zoom. Ten action buttons sit to the right of the screen. If you’re using multiple cameras, you have three different options for viewing them: View switches you to a different camera feed each time you press it, Patrol automatically cycles through each camera view every 10 seconds, and Split lets you view up to four cameras at once. From here, you can also control the active camera’s optical zoom. You can zoom up to six times the focal length, and though the lens motor makes some noise, it’s not loud enough to wake a sleeping baby. Menu and directional buttons allow you to navigate various camera features and a push-to-talk button activates the camera’s built-in mic so you can soothe your child with your voice. All the buttons are backlit for use in low light. Each camera can play a selection of “lullabies.” These range from actual tunes, such as Brahms’s “Lullaby,” to soothing sounds including ocean waves, white noise, and a heartbeat. The lullabies can be controlled from the parent unit menus or directly on the camera through playback buttons on its base. With all the feedback the VM5271 provides on your child’s environment, it would be easy to stay glued to the monitor. Fortunately, the system supports a number of customizable alerts so you don’t have to. You can set temperature thresholds for the nursery, for example, and activate the parent unit’s vibration alert to let you know when it moves out of range. You can also adjust the camera’s sound sensitivity so you only hear noise that exceeds a certain level. An alert tone can be configured to sound when the parent unit’s battery is low, it loses connection to the camera, or the camera detects sounds (this last works in split-view only). Baby monitors have come a long way from the radio-only devices of just a few years ago, and the VM5271 includes some of the best features today’s models have to offer. If you’re looking for a reliable, easy way to watch over your little one, this system is a great choice. 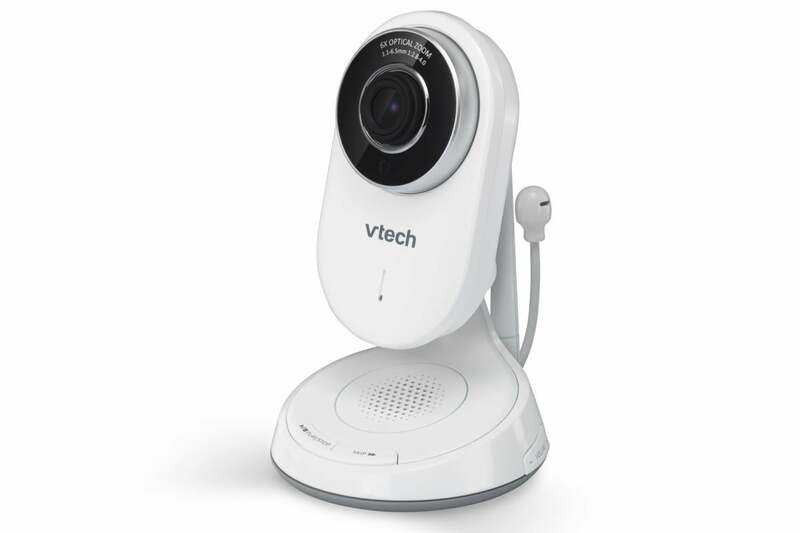 The VTech VM5271 Expandable Digital Video Baby Monitor is an easy-to-use extra set of eyes on your little one.